Last weekend I had a naughty pizza (pictured below) and after the beautiful pizzas I had in Rome I was slightly reluctant as my taste buds have been spoiled. Obviously I order without cheese due to my milk allergy. Now I'm a Papa John girl but the Boyfriend had a discount for Domino's. This is very bad of me but I never thought to check the ingredients for the bases. It was Nicola, my dairy free twitter buddy, who pointed out I should not be eating it. Oops! lucky for me no damage was done as my allergy is not life threatening. Domino's has been the talk of Twitter because this week they launched a Gluten Free base. I checked out the ingredients, thinking in future I could order this. Turns out it's free from milk but it does contain egg white (for those not in the know egg is also one of my allergies). This week I have been disorganised with packing my lunch box for work. It's sheer laziness of not bothering to organise myself. Trouble is I then end up wandering the aisle of Sainsbury's (it's close to the office) on a lunch break muttering about lack of choice. Sainsbury's has a good selection of free from treats that will rot your teeth but never any savoury choices. Anyway, I came across some new Linda McCartney meals in the chilled vegetarian section. 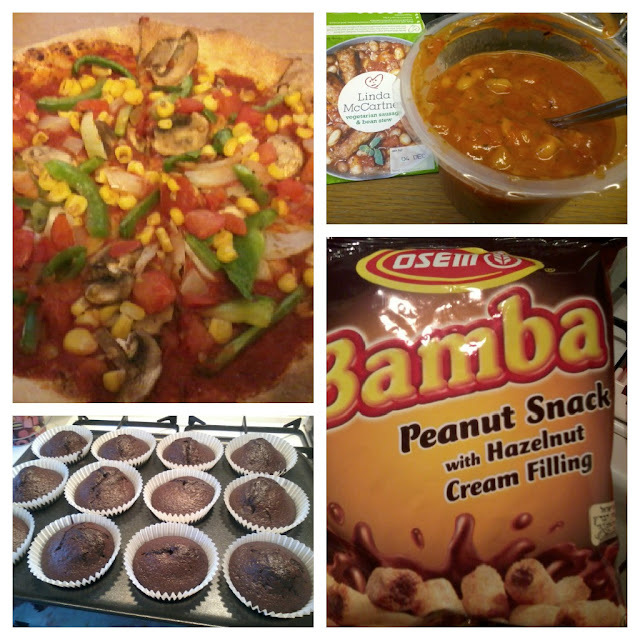 Not all of them are milk and egg free (Vegan) but the Sausage and Bean Stew qualifies. It was tasty but I found only three sausages and too much sauce, it was more like having soup. I probably would not bother to buy again unless I get desperate for choices. Whilst in Sainsbury's I like to have a rummage in the World Food section. You never know on occasions you will find a free from item. I came across Bamba (pictured above). They were tasty but not something I would buy again. I've thrown in a random picture of dairy free & egg free chocolate cupcakes I made last weekend. For anyone wanting a recipe I've mention many times before "Vegan Cupcake Take Over The World" is my favourite, most loved cookbook. Last of my new discoveries is pictured above. Sainsbury's have their own version of Popchips. They are available in a variety of flavours but the BBQ ones are suitable for me as free from milk. 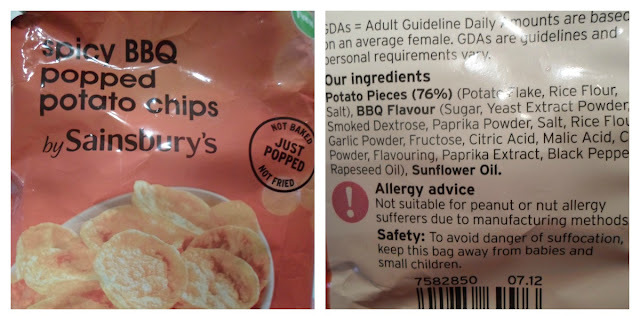 I also notice no mention of Gluten or Soya so worth checking them out if you avoid these ingredients. I did enjoy eating them and would buy again.